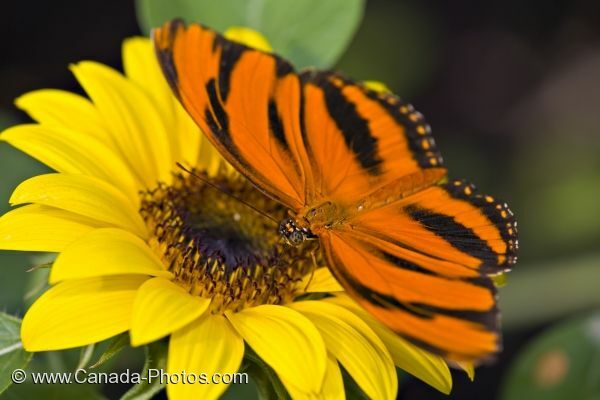 Tropical butterflies flutter about the interior of the Butterfly Pavilion at the Newfoundland Insectarium and Butterfly Pavilion in Newfoundland, one being this colorful orange butterfly which rests atop a bright yellow flower. This tropical butterfly feeds from the centre of this flower allowing visitors to capture a close up picture. In the Butterfly Pavilion, there are over 500 tropical butterflies who reside in a serene indoor garden setting. A waterfall trickles with a bench below making this an ideal location for one of this beautiful butterflies to stop and land on you. Before exiting the pavilion, one must ensure that there are no butterflies attached to their clothing. The Newfoundland Insectarium opened to the public in 1998 by a couple of insect enthusiasts and in 2002, the Butterfly Pavilion was their newest attraction. This is a place where butterflies flutter around you as they partake in their daily chores with exhibits showing the life cycle of these tropical creatures. A tourist attraction well worth seeing while visiting Deer Lake in Newfoundland, Canada. Picture of a colorful tropical butterfly in the butterfly pavilion at the Newfoundland Insectarium and Butterfly Pavilion.